CORPUS CHRISTI, TX – Hosey Jose, the latest character in Solid Waste Services’ Recycle Right campaign, has a reputation for tangling things up. 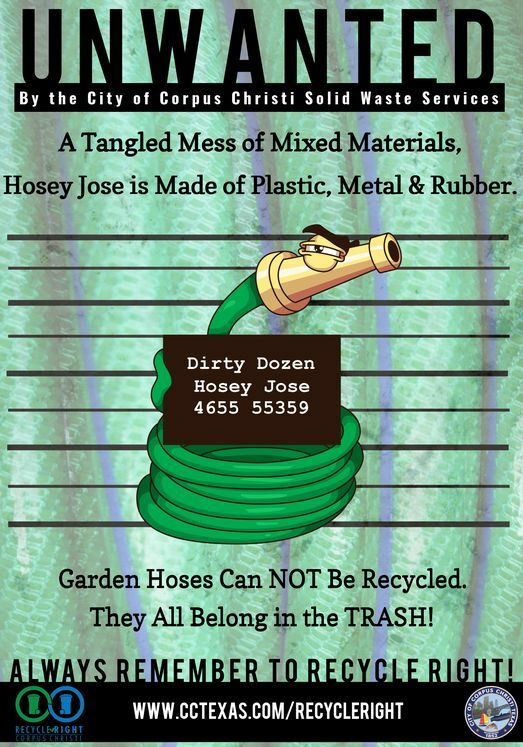 Also known as the garden hose, Hosey Jose always gets intertwined with other good recyclables in the blue bin, which turns them into trash. In addition to getting tangled with the wrong crowd, garden hoses also get caught in the sorting equipment at the recycling facility. The resulting delays cost both time and money. Since most garden hoses are made of different types of plastics which cannot be easily separated and recycled, they should never be placed in the blue recycling bin. Solid Waste Services’ Recycle Right campaign continues to promote ways to reduce, reuse, and recycle. Additional resources are available at www.cctexas.com/recycleright. For more information, contact Public Information Officer Jesse De Leon at (361) 826-3248 or by email at JesseDL@cctexas.com.